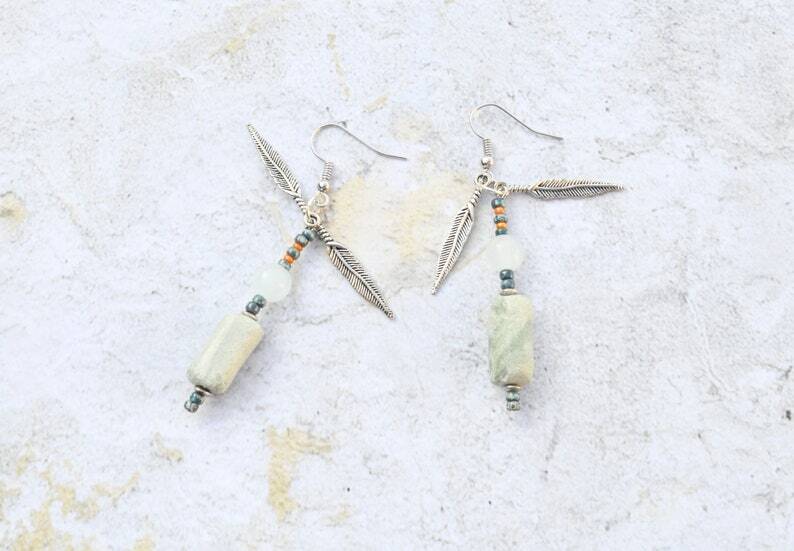 These earrings have silver feathers attached to the dangling beads. The hoops are nickel free and the backings are hypo-allergenic. There's pale green and orange colors along with silver. All of my photos are taken outside to show the true color. My earrings are usually made to match a bracelet so you can either buy a bracelet with the earrings or purchase them alone. They are made from nickel free holders. There is a hypo-allergenic piece on the back to hold it together. * I rotate my beads so if you see something you like I can try to recreate it but it might not be exact because when I go to bead shows I find rare beads that I only buy one strand of. * I will try my best to make sure that you receive each items in perfect condition. If not please contact me. * If you receive something damaged please contact me immediately so we can get it fixed. * If you receive my item and you love it please leave me some feedback so others will have faith in me to order something also. Thanks so much! Have a colorful day!